The much anticipated United States veto of a UN Security Council resolution condemning Israeli settlements came about on Friday. It surprised no one, but, as I wrote last week, the repercussions of this veto are going to be much deeper than the numerous previous vetoes. not veto. But this time the resolution was not only perfectly in line with official US policy, but it dealt with an issue the current administration had confronted head-on but had failed to affect in any measurable way. 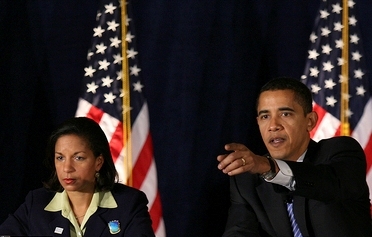 Susan Rice’s statement of explanation about the US veto is an absolute mess of double-talk and distortions. This really isn’t surprising; there is little doubt that the White House and State Department made the veto decision based not on a sober analysis of what is best for Israel or the Palestinians or for US interests in the Middle East. No, this decision was made because of the massive congressional pressure that was brought to bear on this question. And, in turn, that congressional pressure came at the behest of AIPAC. That’s why the explanation sounds so thin, why it is based on tired clichés that we’ve heard for years and have long since been exposed as threadbare. And I say this as one who is not a subscriber to the Israel Lobby theory, who has, in fact, written extensively to the contrary. But in those writings, I never tried to deny that the Lobby has enormous power in Congress, and this is a case where that is very effective. Our opposition to the resolution before this Council today should therefore not be misunderstood to mean we support settlement activity. On the contrary, we reject in the strongest terms the legitimacy of continued Israeli settlement activity. For more than four decades, Israeli settlement activity in territories occupied in 1967 has undermined Israel’s security and corroded hopes for peace and stability in the region. Continued settlement activity violates Israel’s international commitments, devastates trust between the parties, and threatens the prospects for peace.